House Clearance & Probate Valuations > Probate Search! Wills, legal documents, valuables finding service. Probate Search! Wills, legal documents, valuables finding service. We often during the process of our probate valuation & house clearance service attend very cluttered houses and over the years have at the request of our clients undertaken the task of searching through mountains of clutter to locate important legal documents such as wills, share certificates, banking information, family photographs as well as jewellery and other monetary or sentimental items of value. 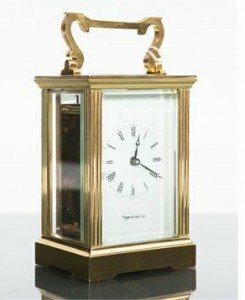 The following items were unexpected valuable finds that were found during the process of searching cluttered properties on behalf of our clients, neither the family of the deceased or the executors dealing with the estate knew these items existed or if they did had no idea of their monetary value. NOTICE! Published with clients permission – Some facts may have been altered to protect our clients privacy. 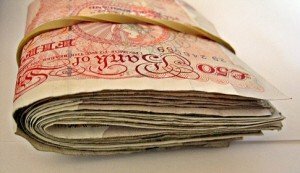 A large amount of money was found for a client in London, the notes were hidden under carpets, behind furniture and various other places around the house. 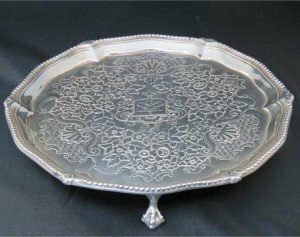 A George III HM silver salver with piecrust rim and three cast feet below. 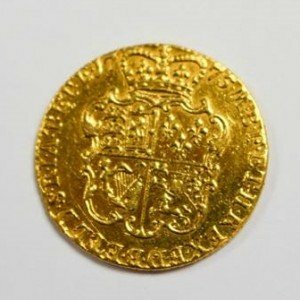 The surface with foliate decoration around a heraldic shield with wyvern crest, London 1775, 16.5ozt. A Rolex watch head. 9ct yellow gold case, import hallmarked Glasgow 1927. Signed manual wind movement. 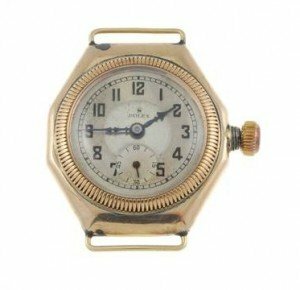 Silvered dial with Arabic numeral hour markers, subsidiary seconds dial to six. 23mm. 16gms. 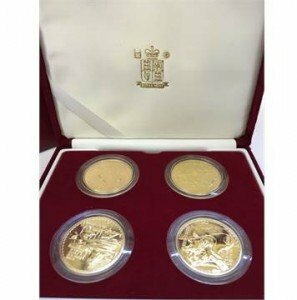 A set of four Royal Mint Issue Britannia design One Ounce Gold Bullion coins, decorated with images of Britannia, designed by Philip Nathan, each one ounce coin measuring 32.69 mm diameter, is struck in 22 carat gold and weighs 34.05 grams with a denominational value of £100. 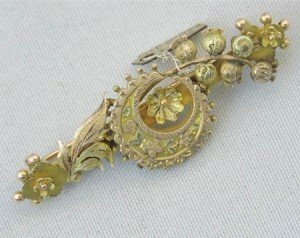 A 9ct gold bar brooch hallmarked Birmingham 1891-2 with central crescent having applied flowers with additional leaf and flower design on bar, 3.2g. 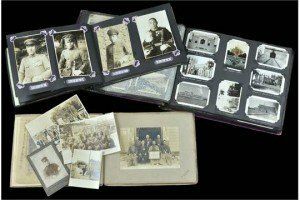 Photograph Albums British India 1920s and two Japanese albums one featuring Imperial Officers, the first with a very large selection of snapshots mainly North West Frontier with places and soldiers named, the majority appear to be Royal Artillery Units. 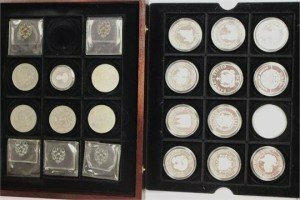 Silver proof crown sized coins, ‘Queen Elizabeth The Queen Mother’ x 12 and Barbados one dollar 1994, all in wooden case. 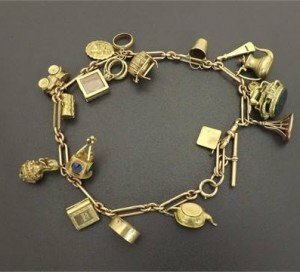 9ct watch Albert with an assortment of gold charms and two fobs, 116.9gm. A Second World War ‘Burma Campaign’ M.C. group of five attributed to Lieutenant L. A. Peterson, Royal Tank Regiment. 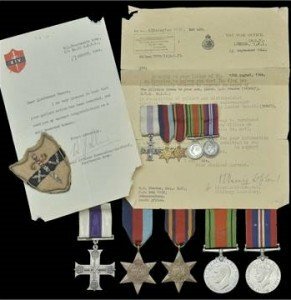 Military Cross, G.VI.R. reverse officially dated 1944, in Royal Mint case of issue; 1939-45 Star; Burma Star; Defense and War Medals. 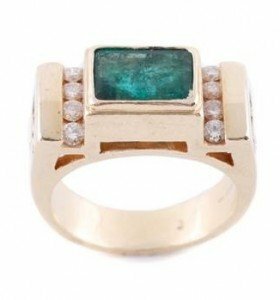 A ladies 14k yellow gold, diamond, and enhanced emerald ring comprising a central natural, bezel set, emerald cut emerald (approximately 2.25 carats, color: dark green, clarity: I3 enhanced) accentuated to top and sides by 20 natural, channel set, modern round brilliant and baguette diamonds. A coloured diamond and diamond cluster ring. 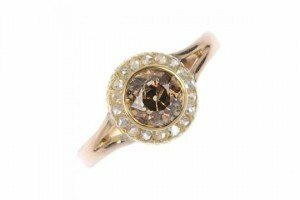 The old-cut ‘brown’ diamond, within a rose-cut diamond surround, to the replacement band. Principal diamond estimated weight 1ct. Weight 2.7gms. 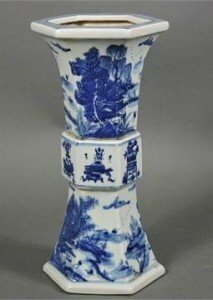 A Chinese blue and white hexagonal vase, decorated with river and mountain scenes, bears character mark to base. 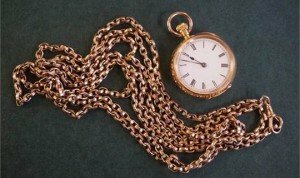 A Ladies 18ct gold pocket watch and 9ct gold chain the watch monogrammed, weight of the watch 33.7g, weight of the chain 36.4g. Tiffany & Co (American (New York), founded 1837), circa 1940-1941. 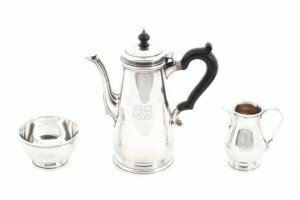 A sterling silver coffee set comprising a 1.5 pints coffee pot, creamer, and sugar bowl. 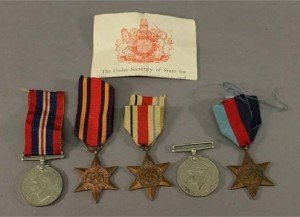 A world war two medal group compromising Defence and Victory medals also Africa, Burma and 1939-45 Stars, held in box with original slip. 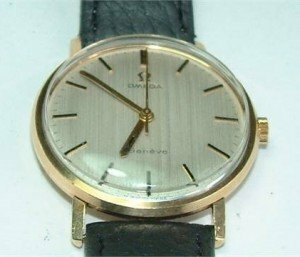 Omega Manual Wind Gentlemens 9ct Gold Wristwatch. Yellow gold circular face with hourly applied markers. Movement 601 plus logo on the crown. Inside case markings Omega watch 1067/S – 1317712 Gold markings OWC 9 .375 t.
An 18ct gold sapphire and diamond cluster ring. 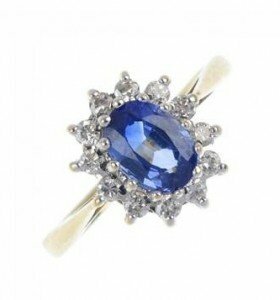 The oval-shape sapphire, within a brilliant-cut diamond surround, to the plain band. Estimated total diamond weight 0.25ct. Hallmarks for Birmingham, 1988. Weight 2.7gms. 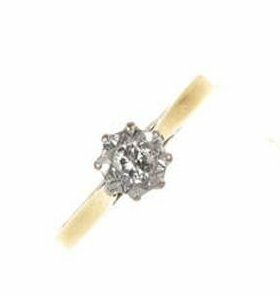 An 18ct Gold Diamond Single stone ring, The brilliant cut diamond in an illusion setting within a solid gold band. Estimated total diamond weight is 0.20ct Hallmarks for chester. Guinea 1775, mount marks on obverse at GE and GR in legend.